Pakur, previously known as Pakaur, means (skirt of the hills) is located in the north eastern part of the State of Jharkhand . It has an area of 1805 square kilo-meters. 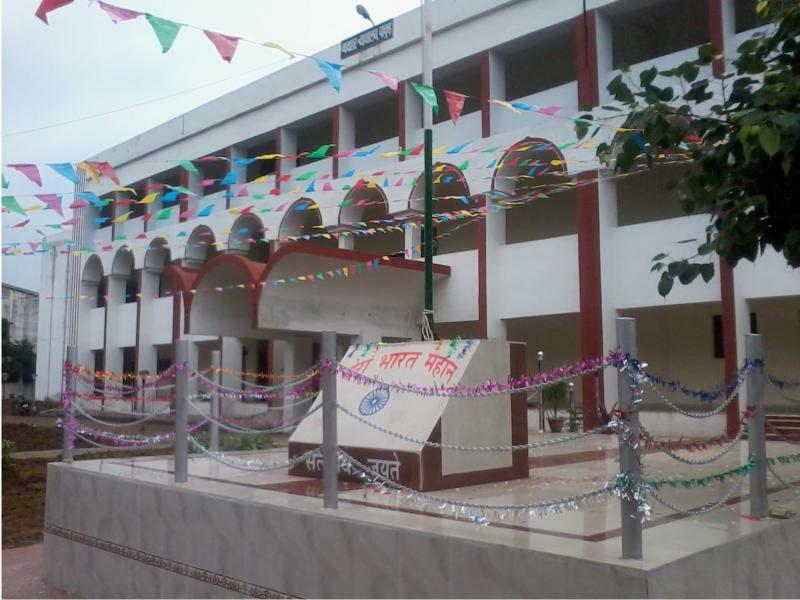 Earlier, it was part of Santhal Pargana District and when Sahibganj became a separate district, it became one of its Sub-Divisions. It became a District on 28th January, 1994. Its boundary is shared by Sahibganj District in the north, Birbhoom District of West Bengal in the South, Murshidabad and a part of Birbhoom District of West Bengal in the East and Dumka and Godda Districts in the West. It exists between 300 40I and 250 18I north latitude and between 860 28I and 870 57I east longitudes. Literacy rate of this district is 50.17% (Female literacy rate 41.23% and male literacy rate 59.02%). It has six blocks -- Litipara, Hiranpur and Pakur in the north, Amrapara and Maheshpur in centre and Pakuria in the south. Traditionally, Pakur has been the land of Santhals and Mal Paharia Adivasi people. However, over a period of time, demographic composition has gradually changed and the local folks have come to the mainstream of the Indian society. 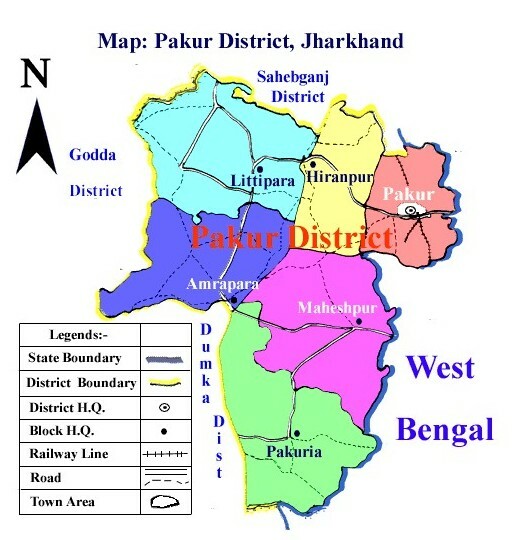 Pakur is surrounded by three main rivers namely Bansloi, Torai & Brahmini. Bansloi and Torai rivers flows in the middle while Brahmini flows in the southern part of the district. Pakur is rich in minerals such as coal, china clay, fire clay, quartz, silica sand and glass sand. Industrially the district, is not developed but in respect of mines, Pakur is famous for stone industry. Approximately 585 mines and 800 crushers are in operation where around one lakh labourers are engaged. The stone industry is paying eight to nine crore rupees per year as royalty to Government in addition to commercial taxes. The quality of black stone chips of Pakur is excellent for construction of buildings etc . Black stones of Pakur are also exported to other South Asian countries. Since last decade there has been an enormous activity of coal excavation in the area as well. It has one of the biggest reserves of coal in the world. Currently only one block of coal is active in the region. It has been allotted to the Punjab State Government for their captive Thermal Power Plants. The excavation work on behalf of the Punjab State Government is being done by PANEM. It is a private - public joint venture between Punjab Government and EMTA. In the absence of major industries and employment opportunities, the economic options are limited to agriculture. Stone chips, rice milling, biri rolling, manufacturing of gur from sugarcane and date (Khajur), forest produce such as Mahua, Sabai grass, tasser, and bamboo are the sources of generating income for a significant proportion of the people of the district. Barbatti (vegetable) is also good source of income for the Paharia tribe. Poultry farming, piggery, animal husbandry and fisheries also provide supplementary income. Railway s - 46 Express Trains & 18 Local Trains Up and down cross daily trough Pakur. Bus - Approx 35 buses arrive and depart daily from and to various destinations. Regarding "Pro Bono Legal Services"